If you’re anything like I am then your make-up bag is littered with half-used tubes of mascara. Some you use with one another, others not at all. Fallen soldiers in the pursuit to find the best volumizing, lash lengthening miracle worker out there. It’s a challenge to find the perfect one! One thing that I’ve noticed is the style of brush used is key. Some of the mascaras you buy have very widely spaced bristles. I’ve found that this causes the application to become too heavy. You wind up looking like you’ve gobbed on the mascara and your lashes end up clumped together. Some have too many bristles. In this instance you either end up with a very thin coat (it’s almost as though you have none on at all) or you have raccoon eyes from applying it so aggressively in an attempt to get more on your lashes. I have blonde hair and in turn, blonde lashes. So, a good mascara application is important so that I don’t look washed out. I used to be a VERY loyal user of Cargo’s SupersEyes. However, they made a fatal mistake…they changed their brush! They switched to a brush with bristles that were too widely spaced. Dear Cargo, if you’re wondering why sales fell off on this product it is because you tried to fix something that was not broken. After months of agony and countless mascara purchases I have finally found a superb replacement to my Cargo companion. Christian Dior has released a little beauty gem called Diorshow Extase. No longer shall I mourn the loss of my old mascara. This stuff is fantastic! Not only does it have the appropriate bristle spacing, they went one step further and varied the length of the bristles. 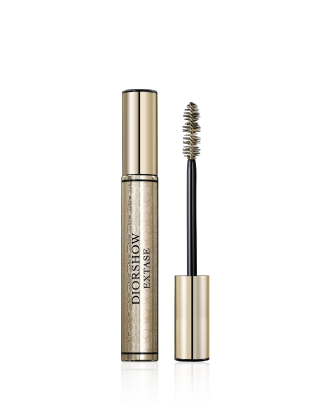 Now your very short, newer lashes AND long, older lashes get an even coat of Dior’s well formulated black magic. I dare say it’s the equivalent of false eyelashes in a tube! If you are in search of a great mascara, give this one a whirl. They have my ringing endorsement! This entry was posted on Thursday, April 28th, 2011 at 9:08 AM	and tagged with beauty, eyes, fashion, lashes, make-up, makeup, mascara, style and posted in Beauty. You can follow any responses to this entry through the RSS 2.0 feed. « Scope out the swimwear!